Love. Ain't it grand? It's February, the month of love and chocolate. Yum! My grandmother has put together a spectacular Lovers Trail Festival. There will be cheese tastings, wine tastings, ice skating competitions, outdoors festivities, weddings, and more. At the Cheese Shop, we're putting together fun cheese baskets. Lovers' baskets, Rebecca calls them. With heart-shaped cheeses and more. And get this! I'm one of the ones having a wedding. It's true! I'm getting married in just a few days. To Jordan! I can't wait. He's out of danger. We can move forward. Everything is in place. Tyanne is helping with all the planning. The flowers. The chapel. Freckles is putting the finishing touches on my dress. Yep, love is definitely in the air. My toes can barely touch the ground. I find myself whistling all the time. And smiling. And warm to the core. Sure, it's cold out. Snow, rain, sleet, but nothing is going to spoil my mood. Nothing. Have you ever felt like the world is your oyster? By the way, TODAY my author is having a giveaway; she's nearly as excited as I am. Why? Because she has a new book out. AS GOUDA AS DEAD. One lucky commenter today will win his or her choice of a CHEESE SHOP MYSTERY. Fun, right? So comment away!! Oh, and don't forget to leave an email...as cryptic as you want. She's a mystery writer. She'll figure it out. 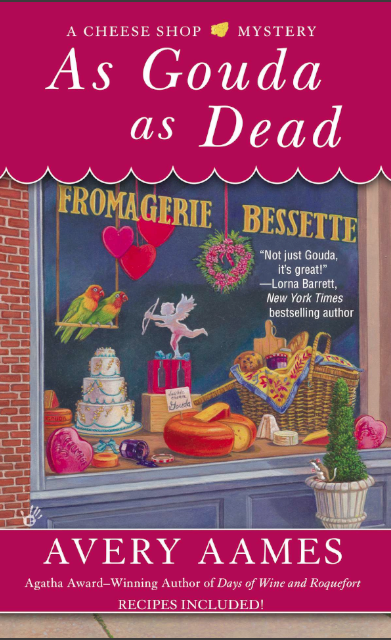 AS GOUDA AS DEAD is available for order here. Hello, Jen! What a delight to hear from you! Sounds like a fun series to read; hope to get a chance to read them, thank you! Dianne, I hope you feel that way at least once in your life! It's a goose-tingling good feeling! Thanks so much, Dawn. It's a fun story. I'm looking foward to reading this too. 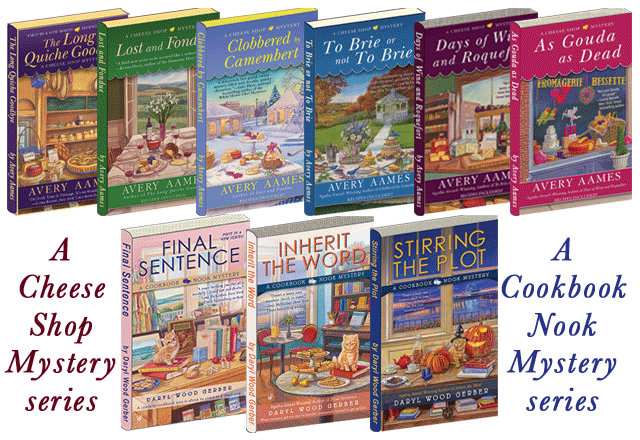 I'm a HUUUUUGE fan of the Cheese Shop Mysteries and would love to be your winner. Other than the latest book I only need Clobbered to bring my collection almost to date. I love this series. I'd Brie so happy if I won! I even have a brother (Chet) who has always been called Cheddar Cheese by his 3 sisters. I Gouda put this entry in other words but Edam then it wouldn't have been as funny. Thanks for giving me the enjoyment of reading your books! Oh, Lisa, you are too punny...I mean funny. :) Cute use of cheese words throughout! Your sweet brother must have suffered, in a good way. I've put my cousin Matthew through the ringer on occasion, but then he retaliates. I think we all feel the world is our oyster, at some point in our life, especially when young and so much of life ahead. Today, a really good book suffices, because it can take us anywhere! Congratulations on book 6, in a wonderful series! patucker54 at aol dot com. Patricia, thanks so much! Yes, with life ahead, there is always so much hope. I love being hopeful. A cheese basket??? Be still, my heart! Those days when we have the whole world in our hands are wonderful, aren't they? I hope that for Charlotte it lasts as long as possible. Thank you so much for the good wishes. I love hearing from all of these lovely readers. My story isn't a big one. Like so many, I live a normal, simple life (other than the occasional murder that needs to be solved). I appreciate all those who join me on the journey. Traveler, it is truly a delicious feeling. I wish you the experience. Petite, I'm with you when it comes to a good book and a snack. Ahhh. Looking forward to As Gouda As Dead. I don't think I've ever felt like the world was my oyster. I suppose we have all felt that the world was our oyster at some point. Now, I realize that isn't the case and I explore other worlds through books! Thank you for the contest! Betty, I love to read, too. It helps me "see *& feel " more of life. Betty, you are today's winner! Congrats! You'll have 48 hours to contact me. I've read the first 3 books of this series and really enjoyed them. I think it's time to get caught up with 4, 5, and 6. I'd love to win #6. Sue, so nice to hear from you. Enjoy all my adventures. Kicha, my author always loves new readers!!! Welcome. Terri, I love libraries. Tell your librarian to tell other librarians, okay? Sara, I totally understand. I feel the same way when I find a new author to read. Luckily there are lots of books. I feel like the world is my oyster when I have a stack of new books to read. Thank you for writing fun books! Actually, I had a great day at work today, and had that type of world is my oyster feeling when I got home! Charlotte's grandmother is a great character! Looking forward to the new release Thanks for the chance to win! Thanks, Holden. Glad you had that kind of day!! congrats & continued success to Avery!! Wow, Carol, what a great memory! There are times when I feel like I have it all. Your books all look so good. Keep them coming. Brooke, you've read it already? Cool! Thanks. Looking forward to this one!!!! I love mystery books and would like to be included in the contest. Love this series. 80 degrees and a good book!!! Love this series. Congrats on the new one. Excited to read this one...even though it always makes me hungry for cheese. Better go grocery shopping first! Cats like cheese and I like books. Love your books! Can't wait to read the newest in this series! I cherish the days when everything seems to be going right. It is a great feeling! Thank you for the chance to enter your contest. I hope everyone is having a great day today! rachaelb2014 (at) gmail (dot) com. This is one of my favorite series. Thank you for a chance to win a copy of As Gouda as Dead. Looking forward to this next installment! I so enjoy these mysteries. Cheese and mystery make this a really enjoyable series. How fabulous! I'd la la LOVE to win! Oh I hope this is still open. I would love to read a Cheese related book. Yum.